Power supplies and mobile phone coverage could be affected when the tail end of Hurricane Ophelia arrives in Northern Ireland in Monday. The Met Office issued a severe weather warning on Thursday. The Chief Forecaster says the severe wind may cause havoc in County Antrim, County Armagh, County Down, County Fermanagh, County Londonderry and County Tyrone. According to Met Office high wind will be felt in Northern Ireland between 9am on Monday (October 16) and 11.55 pm. The Met Office revised the weather warning to include most of Tuesday too. "A spell of very windy weather is likely on Monday in association with ex-Ophelia," said a spokesman on the Met Office website. It's estimated that wind speeds will reach as high as 70mph and 80mph. "These strong winds are forecast in association with the northward track of ex-Ophelia across or near to the west of the British Isles. Heavy rain is also possible in association with this system with northwestern UK most prone at this stage. "Some delays to road, rail, air and ferry transport are possible. There is a slight chance that power cuts may occur, with the potential to affect other services, such as mobile phone coverage. "There is a slight chance of some damage to buildings, such as tiles from roofs. 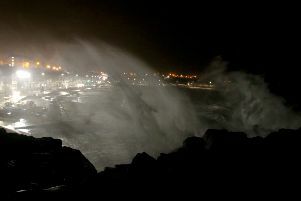 "It is possible that some coastal routes, sea fronts and coastal communities will be affected by spray and/or large waves. "There is also a small chance that injuries could occur from beach material being thrown onto sea fronts."